The Stellarvue SV102T refractor is a stylish yet powerful 4" aperture f/7 air-spaced apochromatic triplet with 714 mm focal length. With regards to the Stellarvue SV102T's optics, many experts attest to their superiority. This model includes an upgraded 3" Feather Touch focuser. Features Stellarvue's most recent lens design with a high Strehl objective that has been certified. As far as 4" class visual telescopes go, the SV102T ranks among the best. In turn, with a photographic field flattener (sold separately). The optical tube is fully baffled and made of aluminum to reduce the overall weight significantly. In fact, with rings mounted, this OTA is only 11 lbs. Plus, the focus easily detaches to lessen the length of the tube to only 19.25", a size well within the confines of airline carry-on limitations. This allows you to keep your high class APO refractor system with you on your flight. An interferometric test report from Stellarvue is included with these 101.5 mm clear aperture optics to demonstrate that they are .95 Strehl or higher. This is as good as it gets so the only obstacle to seeing or imaging an object will be the current atmospheric environment. The SV102T, like all Stellarvue telescopes, is triple tested prior to being shipped from the Stellarvue facility. With its fully multi-coated, high Strehl objective offering spectacular visual performance, the SV102T is among the sharpest 4" class refractors ever made available. This APO Triplet is also designed to be a high quality imager, making it an excellent dual purpose telescope for both visual and photographic use. At the core of the SV102T's performance is Stellarvue's triple tested, high Strehl objective with an Ohara FPL-53 center element. This enables this 102 mm f/7 apochromatic triplet refractor to provide incredibly high contrast, along with color correction akin to a reflector. 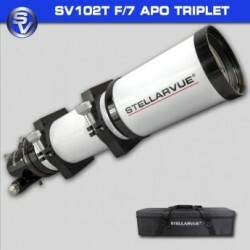 The lens is triple tested and is as well-made as any 4" APO Stellarvue has ever offered. Package includes an interferometric test report to confirm this. All six air-to-glass surfaces contain extreme broadband multi-coatings to help improve contrast beyond its previously high level. This allows for stars that appear more vivid over a background of velvet black. In addition, these extreme broadband multi-coatings transmit areas above as well as below the visual spectrum to minimize reflections encounted with CCD images. A gorgeous Stardust White finish gives this aluminum optical tube and dew shield an appealing look. Contrasting against the black anodized aluminum fittings, this white finish gives the SV102T a sophisticated style. Weighs only 11.2 lbs. with the 3" focuser and rings attached. Dew shield is fully retractable for easy storage between uses, and fully extendable to reduce nighttime dewing of the objective while serving as a glare shade during the day. Because the focuser unthreads so effortlessly, the length of the OTA can be minimized to allow this top-of-the-line APO refractor to be carried with you on an airplane. The main tube assembly features internal "ultra flat" black paint and is fully baffled in order to eliminate all tube wall reflections. Optical path reflections are further reduced through the use of edge blackened objective elements. All of these components combine to help maintain the spectacular contrast experienced with this incredible apochromatic lens. The SV102T APO Triplet Refractor comes with two CNC-machined, lightweight hinged aluminum mounting rings made in the USA. Each ring features five screws with 1/4-20 threaded holes on both the top and bottom. There is one hole in the center that is flanked by two holes separated by 1.5" and two outside holes separated by 60 mm. For telescopes mounts using a Vixen style rail, use the optional TP10 rail. Mounts using the larger Losmandy style rail can use the TP6 dovetail plate. These are available in the "Accessories You'll Need" section on the left. Heavy-duty Nylon hard case with thick padding and tough zippers. This case will last much longer than the thinly walled hard cases manufactured in China. When compared to the human eye, the Stellarvue SV102T has the ability to gather 213 times more light. Maximum power for 4" refractors in agreeable conditions, according to the Dawes limit, is approximately 300. But since this is a genuine high Strehl APO triplet refractor, this power can be exceeded on a steady night. Save $50 on the Stellarvue 2" Dielectric Diagonal when you purchase it together with this telescope. If you add the diagonal to your order it will be packed safely away in the included telescope case along with your new refractor. This diagonal uses a thick, oversized mirror polished to 1/10th wave. The mirror has a protective, dielectric coating with 99% reflectivity. It has a compression ring eyepiece tube and the insert tube is beveled to better seat the diagonal in the focuser. A rubber grip on the 2" tube allows for easy handling in cold climates. This 2" diagonal is assembled, adjusted and double tested at Stellarvue for perfect alignment and performance. The five-point cushion system eliminates pinching in all climates and the precision CNC machined components assure perfect alignment that stays that way. Use the focuser's 1.25" adapter with the diagonal when you want to view through your 1.25" eyepieces. Objective Lens: 102 mm clear aperture with f/7 focal ratio and 714 mm focal length, apochromatic triplet with FPL-53 center element. Conforms to Stellarvue's standard of .95 Strehl or higher. Comes with test report. Tube Assembly: Machined aluminum tube with external instrument white finish and "ultra flat black" interior. Weight: With rings and focuser attached, the optical tube weighs in at 11.2 lbs. Dimensions: 4.13" diameter and 19.25" long in travel mode with focuser unthreaded; 23.5" with focuser attached and dew shield fully retracted; and 29" with focuser and a fully extended dew shield. Rings: Pair of R105 rings with five 1/4-20 threaded holes on the top and bottom of each. One center hole with two inner holes with 1.5" spacing and two outer holes with 60 mm spacing. Case: Tough C009S Nylon hard case with thick padding. Light Gain: 213x the naked eye.